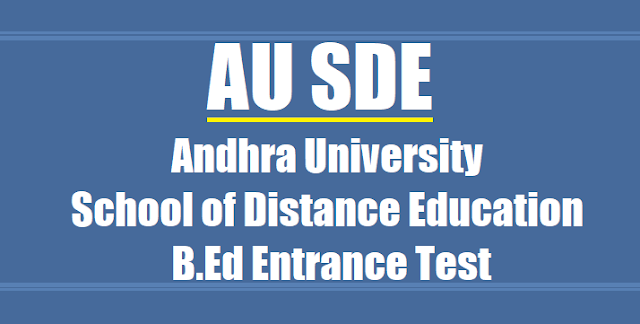 AU- Distance-BEd-Entrance-Test-2017 - Andhra University - B.Ed Programme through Distance Mode: Andhra University School of Distance Education, Visaka Patnam, Andhra Pradesh has given Distance B.Ed Entrance Test 2017 Notification and AU SDE invites applications from the eligible candidates for admission into 2 year B.Ed Programme through distance mode. For admission into B.Ed. programme, the candidate should have passed any Bachelor's Degree (except BFA/BAOL) with a minimum of 50% marks from Andhra University or any other University recognised as equivalent there to. However, SC / ST / BC / PWD candidates need to possess a minimum of 40% marks as per rules of State Govt. of Andhra Pradesh. The candidate must also be an in-service candidate and working in Government Recognized Schools or working in Educational Sector as primary, upper-primary teachers with SGT/ PRT/ TTC / D.Ed. / D.El.Ed. / D.P.Ed. / Pre-primary / Montessori / Fine Arts / any course in Education approved by University / NCTE. Candidates can also download the application form from our University website. However they have to pay Rs. 300 by way of DD drawn in favour of Registrar, A.U. towards cost of application form and submit the same along with the application. 5. Two Self-Addressed envelopes of 11x 5 size. 3. Last date for receipt of filled in application form with fine of Rs. 300/- upto: 01-09-2017.